Today's headlines bring you another Pirate loss, news on the fired pierogi, the NHL Awards (and Hall of Fame inductions), Aki Iwamura, Mick Williams, and much more. The Pittsburgh Pirates' two-game winning streak is over, thanks to Josh Hamilton and the Texas Rangers. The Rangers pulled out a 6-3 victory in a rare interleague game against the Bucs behind the hitting of Hamilton (home run, double) and Julio Borbon (three-run HR) and the pitching of Tommy Hunter, who allowed three runs over six innings. 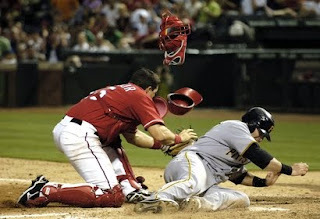 On the Bucco side, it was another long night for Ross Ohlendorf, who failed to get out of the fifth inning, lowering his record to 0-6. Bobby Crosby had three hits, Neil Walker and Lastings Milledge doubled, and Pedro Alvarez singled to pace the three-run output for the Bucs. I would be remiss if this recap didn't also mention third-base coach Tony Beasley, who gave Ryan Doumit the green-light for home, where he was out by 15 feet. Andrew Kurtz, the man famous for losing his job as a Pirate pierogi racer, was offered his job back by the team, and he accepted. "The employee has been rehired because he was not terminated in accordance with company [human resources] procedures," Brian Warecki, the team's communications director, said in an e-mail Tuesday night. "While his conduct was in violation of our company policy (and many other companies), it was not subject to termination at this time." "The fact of the matter is that neither HR nor senior management were involved in the decision to fire the employee," Mr. Warecki said. "When they were made aware of the improper termination on Friday evening, they conducted an investigation into the firing. Upon learning the facts of the case and determining that he should not have been fired, [management] contacted the employee Saturday morning to offer him his job back, and he accepted." The Pittsburgh Penguins' 2010-11 schedule was released yesterday, and it's a challenging one. 15 back-to-back situations, a five-game road trip and two four-game road swings highlight the difficulties. Sidney Crosby is a finalist for the Hart Trophy, Ted Lindsay Award (formerly the Pearson) and the Mark Messier Leadership Award at tonight's NHL Awards Ceremony in Las Vegas. And don't forget, Jordan Staal is a finalist for the Selke Trophy, which is awarded to the league’s top defensive forward. Tom Barrasso failed to get elected to the Hockey Hall of Fame, in a class that was absolutely bashed by ESPN's Scott Burnside. Aki Iwamura, the Pirates' latest broken-down free agent signing and the inspiration for a Joe Starkey song, accepted an assignment to Triple-A Indianapolis yesterday. Gene Collier is the best columnist that paper has, however it really isn't fair to compare Vlad to Aki in free agent signings. First off, Aki was a trade not a signing. Second off, Vlad is exclusively a DH with the Rangers, he is no longer the 5 tool player we remember from his days as an Expo/National. Had the Pirates signed Vlad, where would he play? Good look at the trades though with Bay/Texiera, just shows how trades can go two different directions. Do you think Ron Washington and Josh Hamilton take turns trying to snort the first base line before games? So... the Pirates can't even fire people correctly? If Collier is suggesting that if Huntington were a better GM, he could have gotten a similar package for Bay as the Rangers did for Teixiera than someone needs to take his crack pipe. It's apples and oranges. Bay isn't even close to as valuable as Tex, thus, the Pirates got a lesser package. I understand the Bay trade has been disappointing to this point but comparing it to the Tex trade is a hilarious overstatement of Bay's skill relative to Teixiera's. People around here tend to have tunnel vision with regards to how good the old core of players was. Beyond Bay, they were all average players at best. Bay was a good player, much like McCutchen and to a lesser extent Jones are right now. Teixiera is an elite talent. Not remotely close to the same level as Bay. No matter what you think of the Pirates, or the trade of Jason Bay, this comparison is so flawed it isn't even funny. I don't know if he was implying NH should have gotten the entire package that the Rangers did for Tex, but at least a somewhat viable return as opposed to the 4 stiffs we ended up with. It has been my belief that NH favors quantity over quality in his deals. I agree that Teixeira is way, way better than Bay. It only makes sense that a team would be willing to give up a lot for him - he's arguably one of the best players in baseball. Bay is just a good player to have. That said, that trade was still a flop. I always liked the Dodgers side of it (Andy LaRoche has made me look like a fool, but Bryan Morris is looking good), but I had never heard of Brandon Moss and Craig Hansen when we got them from the Red Sox. Bay isn't an elite player, but I always thought we should have held out for more from Boston. Moss didn't project to be anything better than a good fourth OF and even if Hansen lived up to his expectations, he's still just a reliever. And after all, Boston is the team Bay went to, not LA. I'd have rather seen them get one top 10 prospect from Boston's system (which I think they could have gotten for Bay, but obviously I'm not privy to the negotiations) than the two Major League scrubs we got. Bay isn't Tex, but it's still a dump and knowing they would never sign him near his value at the time. That said, it doesn't surprise me at all he is having the season at Citi Field. One last thing: Collier is the reason why newspapers are becoming extinct. That was a 'mail in' article that could be written by anyone with a high school degree.